A Hydration Game for the 21st Century using the Spark Core! Wizard Staff is a popular drinking game in which one tapes consecutive new cans of liquid on top of their empties, and thereby creates a "Wizard's Staff". If one's staff is longer than another player, then that higher level wizard may instruct the lower level wizard to hydrate himself. But what if your liquid of choice doesn't come in cans? All our source code can be accessed via our GitHub. 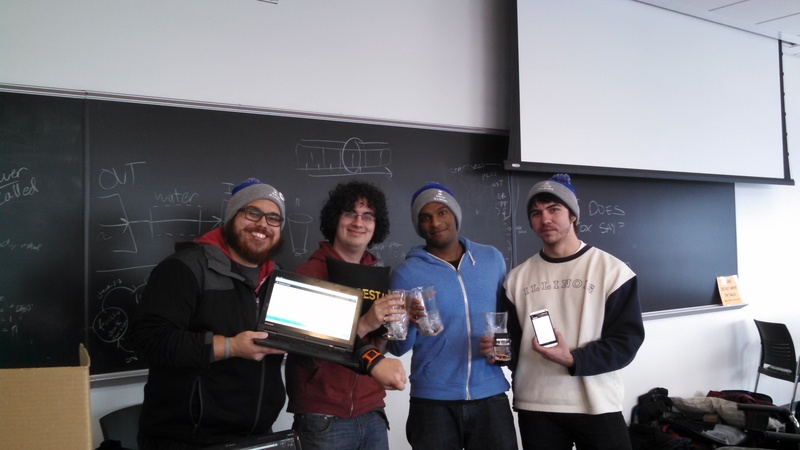 Our project was featured on Hackaday and we were the winner of the Best Use of Spark Hack at Hackillinois 2015! WizardStaff was built on the following technologies. Spark Core - embedded platform. StrapKit - wearable software platform. MPAndroidChart - Android plotting library. Node - web development platform. Grunt - web development task runner. Pure CSS - CSS framework of choice. Sass - CSS preprocessor of choice. Team Brady Rocks built WizardStaff in 36 hours. Thanks to Brandon Seiser, for coming up with the idea, and letting us run with it. Thanks to Brady Salz, Kashev Dalmia, and Dario Aranguiz.